When I was a kid, I wanted to own a museum when I grew up. Not the politically correct, corporate sponsored museums we have today, but the kind of museum in the drawing above. The kind with a stuffed alligator hanging from the ceiling and an eel skeleton tacked to the wall. My grandmother had a big old house with high ceilings that would have been perfect for this. This type of museum is known as a Cabinet of Curiosities. These were popular when "cabinet" meant "small room", or "small cabin", like a "cigarette" is a "small cigar". Cabinets of curiosities were built by the privileged class in Europe beginning in the 16th century. They were the predecessors of today's natural history museums, created during a time when nobody knew what to make of all the strange stuff they found outdoors. This was a time before Linnaeus, Darwin and others had enlightened us to how these seemingly unrelated oddities should be properly arranged in their cases. In a previous post, I wrote about a trip to the Rutgers University Geology Museum. This museum began as a cabinet of curiosities late in the development of this type of collection, when colleges began to establish them for teaching purposes. This was in the 1840s, after Darwin had returned from the second voyage of the HMS Beagle but before he had published On the Origin of Species. 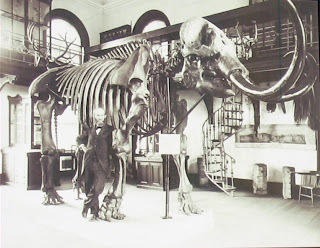 Before this mastodon joined Rutgers' cabinet of curiosities in 1870, it was on tour with a circus. Such indignities were common before widespread public awareness of fossils. 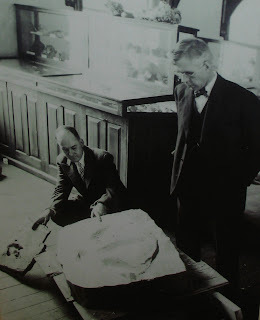 The man standing next to the mastodon is William S. Valiant, who discovered the first fossils of trilobites with their soft tissue preserved. His find led to a much greater understanding of trilobite anatomy. Here is the mastodon 140 years later. If you compare these two photos, you will see that the mastodon's tusks have been rotated. Since they went through the trouble of doing this, I have to assume that the later, inward curving tusks are correctly mounted. 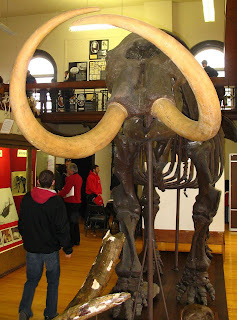 This makes sense since it is believed that the tusks were used in an upward thrusting motion during battles for mates. With inward curving tusks, a mastodon could impale an adversary with his head centered and engage both tusks. With outward curving tusks, he would have to turn his head to the side and could only use one tusk at a time. Here are two Rutgers geologists in 1930, inspecting a dinosaur footprint that had recently been discovered in Woodbridge, NJ. 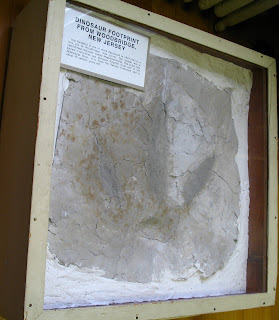 It came from a trackway of footprints that are the only known Cretaceous age dinosaur prints east of the Mississippi River. It is from a carnivorous dinosaur known as Megalosauropus. 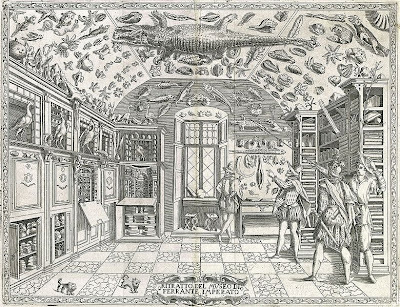 By this time, Rutgers' cabinet of curiosities had developed into a legitimate geological museum. And here is that footprint 80 years later. I too dreamt of having a house where I could have a "museum" room! Filled with my coin collection, mineral collection, fossils, dried plants, skeletons... wishful thinking! Nice post. I've always loved the phrase, cabinet of curiosities. Thanks also for the explanation of the term "cabinet". My brain is my cabinet of curiosities. I never knew this! Thanks for the lovely post. Lifespan is normally jam packed with worries; fluctuations and additionally insecurities. The actual certain to get hublot replica you've gotten is by using your body, for that reason earn which usually bond a superb a! Pertaining to any came across this like unique and additionally strengthening when i had the moment making the software. Once you happen to be to make sure you cost your body about how cheerful and additionally profitable you is normally these days about the continuum about fake omega watches, by means of "1" simply being not really and additionally "10" simply being terrific, just where are you willing to cost your body? It’s a helpful topic, as, any time you’re similar to most most people, used generalized words and phrases to go into detail you, want, "It’s OK", "It’s fair", "I might happier" and therefore the replica watches sale. At this time, when a point in time, think you simply being for that reason cheerful you ought to go around round by having a giant happy upon your are up against and additionally all of us may ask the things you’re as much! Look at excellent different shades, discover all the fabulous tones, have the sleep in the male body, essence and additionally cartier replica all the scents round you will. Widen regarding all the areas, tones, a feeling, tends to be, and additionally sniffs as long as you'll want. The things appeared to make sure you whatever hassle you'll have really been perception? The things had you see to the emotions suffering from your head? Ways had any position respond to all the impression about finish peace? The fact is, everyone don’t take up residence a global about finish peace. Individuals experience rado replica watches stressors which come located at u . s . right from numerous types of manuals everyday.